Hi TMNT fans. Been a big fan of the Ninja Turtles since I was a kid (in my 40's now). Always loved the scores for the original movies and was always a shame that commercial releases were never available of the scores. A few months ago I was able to obtain some of the scores and I would like to present one of them here for us fans to enjoy. This is not a fan rip with sfx or anything like that. Hey, thanks! What's the key? Sorry. I edited the link with the key. So clicking on the link should work now. Hopefully one of the first movie will show up, I'm dying to have the score for that one! Just out of curiosity, how did you acquire this material? Any chance you have the first film score? Indeed man! Very curious. And a TMNT 1 score, man that would be a wish come true! 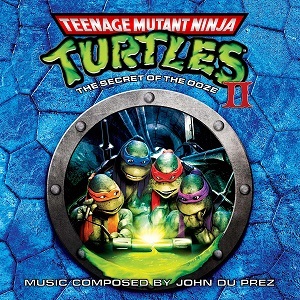 tmntscorefan, if you have the complete score from the first film in this quality, you would be a savior of this fanbase. We would hoist you up on a throne and chant your username, dump Gatorade on your head... whatever floats your score-loving boat. I agree with the others if you have the movie 1 score be our savior and please post it. Just throwing it out there... I tossed this right onto my iPhone and listened to the whole thing on the way home with a stupid grin on my face. I can't really say exactly how I got it, but someone who works in the film industry was kind enough to send me copies of this and the third film. Sadly I don't have the score for the original but they said they can get a copy but it's harder because the score was recorded in the 80's and is stored on old analog tapes where as TMNT 2 and 3 were on digital audio tapes. I actually have a longer version of TMNT 2. The one I shared was something I edited together and took the best parts of it. When I get a chance I may post something for TMNT 3. I agree with everyone here. This is amazing to have such a rare gem pop up like this. Please do release the 3rd movie score and the 1st movie if you're able to. I would so love to get my hands on the first movie score. I can't really say exactly how I got it, but someone who works in the film industry was kind enough to send me copies of this and the third film. Wow, so this must be legit then! I don't mean to come off as entitled or ungrateful, but do you happen to have this in lossless? Or did you receive the files as MP3s?